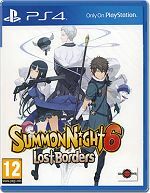 Summon Night 6: Lost Borders weaves an emotional tale of friendship and discovery that begins in the sparsely populated "cocoon world" of Fillujah, where the three main characters (Raj, Amu and Ist) live in virtual isolation. Each has a single companion, a flying sidekick with an amazing special power, and they are all surprised when dozens of strangers begin to suddenly appear-literally falling out of the clear, blue sky. 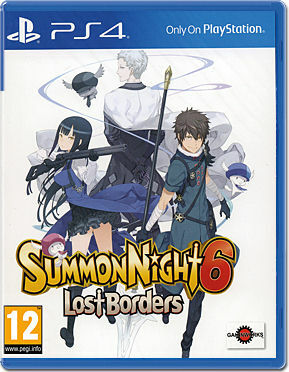 Lost Borders can be played and enjoyed without any knowledge of the previous games in the series, but fans will recognize that the mysterious strangers are actually returning characters from all of the mainline Summon Night games. Originally released in Japan as a celebration of the award-winning series' 15th anniversary, Summon Night 6: Lost Borders offers gorgeous widescreen graphics presented in high definition, a first for the series. The fully 3-D battle system allows Chain Attacks that happen automatically when an enemy is surrounded by two or more allies; in these situations, each ally can hit the enemy without risk of counterattack. In addition to the Summons that are a hallmark of the series, two allies can team up for a breathtaking "Summon Burst" attack that invokes a devastating magical strike from one of many giant fantastical creatures. Combat is only one part of the Summon Night 6 experience. The series is well known for its "night conversations"-one-on-one encounters where various characters confide in one another, leading to a web of elaborate, emotional storytelling with many different branching paths. Lost Borders also includes several charming mini-games: One has you fishing for different types of aquatic creatures, while another involves cooking power-up meals using the bounty you've caught with your fishing pole.